The latest from Jean-Claude Ellena at Hermès, Un Jardin Sur Le Nil, is finally available at Neiman Marcus. I was not able to score a sample (drat!) but did give it a quick try. The verdict: an absolute must have, but as I am too cheap to pay full price, I'll be waiting impatiently for it to appear at the online discounters. The notes are: green mango, lotus flower, aromatic rushes, incense, sycamore wood. It starts with a buzz of citrus (grapefruit? maybe some lime?) and intense green notes; the green mango lends some fruitiness but is thankfully not overly sweet. The top notes have a fizziness that reminds me of Diptyque Oyedo, although they smell nothing alike. The citrus fades, leaving a high-pitched green over a woody base. I cannot make out the lotus flower at all. I was unfortunately not able to try them together, but I would say Sur Le Nil is considerably less sweet and fruity than Un Jardin en Méditerannée. They are very much in the same style though: sheer but deep, a watery, aquatic feel, a woody base note and a touch of spice. Despite the watery aspect, this is a very dry fragrance, with a slightly spicy-peppery undertone. The incense is subdued but adds to the arid, almost dusty feeling. It smells very fresh, but without that heavy ozonic accord that always makes me feel like I am wearing air freshener, and by the same token, I don't catch that synthetic marine accord that most aquatic fragrances have in abundance. Jardin Sur Le Nil is billed as a unisex and I think it could in fact be easily worn by a man or a woman, but if Jardin en Méditeranée was already too masculine for you, this is almost certainly not going to work. And one final caveat: first impressions can, of course, be deceiving. I can think of any number of fragrances that I loved when I tried in a store, but after taking home a sample (or worse yet, a bottle) I decided they were not so impressive after all. 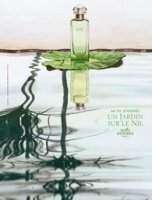 Update, 2/2007: In this case, at least, my first impression held: Jardin Sur Le Nil remains one of my favorite summer fragrances. I must add that the body lotion is really wonderful. It is rather thin — closer in consistency to a body milk — but the scent is true to the fragrance and very long lasting. Hello R!! Wonderful blog – so much fun to read. I tried this new Ellena creation earlier this week and thought it is rather pleasant though the top not of grapefruit and mango was a bit too sharp for my liking. Hope all is well. I started writing a journal type of blog because my brain is like a sieve!! Hello R! Thanks so much. You have a mine of info here and thank you for keeping us upto date. Please feel free to put a link to PerfumePaths. That would be wonderful. If I can figure out the rather simple ebogger (where I am blogging at the moment) – I also want to add a link to yours. Have told a few friends here already though. Am off to India this weekend for two weeks. Just got back from other travels to Rome and London. Crazy life but keeps me going. I love Jardin sur le Nil! I think it's more fruity and less woodsy than Mediterannee, also a gorgeous scent. I also refused to pay full price and picked up a full-size bottle on eBay for about $50. And I am just starting to see the little 15 ml bottles at discount….I love the smaller travel sizes. Do try the lotion if you haven't already, it is marvelous! This fragrance smells, so nice and fresh!, but living surrounded by mango trees, Un Jardin Sur le Nil doesn't smell like the green mangoes we have here. It smells to me like grapefruit in a background of transparent watery florals and green leaves. Unfortunately the fresh fruity top notes last too little on my skin, leaving a light dry “resinous” and slightly woody heart, with a nuance that reminds me of carrot seed or …coriander?. It doesn't smell overly feminine, but I don't see it as a man's perfume as I find it too light. Probably it would be a good fresh scent to use if you work in a closed space. Have you tried the lotion? It is one of my favorites — although it is a light lotion, almost like a body milk — and I think preserves the fruitiness a bit longer. This is totally my favorite perfume since the price is kind of like WHOA I'm currently out of it but will re-up soon. In the interim I am wearing my #2 L'Occitane Verbena for a while! Do shop around, it can be found at discount — the cheapest I see at the moment is 50 ml for $41 at scentiments, or 100 ml for $49 at imaginationperfumery. Hey thanks for the tips! I'm always apprehensive about ordering from the discount place but I trust that you know your perfume stuff so I may give scentiments a go! Thanks again. Bought Kelly Caleche today. Feel so rich! Tried (for the first time) Un Jardin sur le Nil and maybe this will be my next purchase. Feeling happy about a fragrance is a bit like being in love. Can't recommend the Sur Le Nil body lotion highly enough. It is thin, so not the best winter moisturizer, but the smell is just wonderful! I just ordered jardin sur le nil from fragrancenet recently. Now you make me want to hunt for the body lotion ;). I think Tom Ford Black Orchid, however, will be my next purchase. Great choice! I do wish TFBO would show up at the discounters!! ok…I am quite new to this …I don't have an educated nose, I'm still learning what “green,” “amber,” etc. smell like. (aldehydes…noooooooooo). I wasn't sure I even wanted to try this on when I whiffed it from the tester, but on my skin it's lovely. It's going on my wish list. I still adore Jardin Sur Le Nil, but oddly find that I use the body lotion even more than I did the actual fragrance. I love the dry down too, but have to say I don't know the smell of sycamore at all — if that is what it is, I need more of it! Go ahead and laugh at me, call me fickle, cuz you were right all along re EdC – confession: I'm having an affair with UJslN! Yes, poor Eau de Cartier will have to wait for better days since I've just bought a full-size bottle of the gorgeous dry green Nil. Having said that, at the risk of sounding obnoxiously nitpicking, the only thing I'd modify about the Nil is I'd amp up the incense or woods, but other than that it's summer bottled. Happy, moi? Oh yes! YES Dusan!!! And I so agree with you about the incense and woods. Tomorrow I fly to Amsterdam and plan to finally buy Un Jardin sur Le Nil as well !!! Indeed it is the ultimate summer in a bottle. Hey, lucky you! I've still only a small bottle of the juice, but I've run through several bottles of the lotion. I'd amp up the incense too, but you know it layers perfectly (as does the lotion) so that is easy enough to accomplish. Been meaning to try it over Andy Tauer's new Incense Extreme but haven't yet. M, are we longing for summer or what! Have a safe trip and don't come back without a bottle of Le Jardin. R, I'm sure Terre layers nicely w/ the Nile. Luckily I've got a sample of Andy's charming IE too so will play away with them tomorrow. Btw, I tried Kelly Caleche today and thought it was really nice but it didn't quite grab me until the long dry down, which was lovely leathery florals and pale woods. Kelly Caleche has really grown on me, even since I reviewed it. The more I try it next to other modern designer releases the more I think it is an underrated scent. I tried spritzing this several times and on me, the lotus is strong. I didn't like it enough on my wrists. It was not until Sephora gave me a generous sample, and I could wear it spritzed on my back and behind the knees that I fell heavily in love. For summer (which starts in March in the desert) I need a dry, easy fragrance, and this is it. It is an absolute must. Hello Quinn, Un Jardin Sur Le Nil was also wonderfull to my nose after having tried it several times. Nevertheless I missed something, something more sweet or feminine maybe and I found that in Infusion d'Iris by Prada. Was in The Netherlands for two weeks and there I could try Prada's newest scent. Here in CZ this is still nowhere to be found. Anyway my choice would be to spray on Un Jardin S.L.N. one day and the next day Infusion d'Iris. Like that the sweetness of Iris somehow tones down the very dry acidity of the grapefruit and mango of Le Nil. Both fragrances have those beautiful incense basenotes and not too heavy middle- and topnotes. On your back! I've never done that. Well, I can't spend the $30. Fortunately, I already have the Hermes fragrace. And, I plan to wear it when I take my cruise on the Nile this October! I can't wait for the lastest fragrance, based on India, to come out. Sadly, no plans for that trip. Oh, lucky you — hope you'll have a wonderful trip! Have a sample of this. Trying it today. It reminds me a bit of Estee Lauder's Aliage, but not as potent. And it seems to be fading quite fast on me. It's been 2 hours now, and I can barely detect it. It's a great summer scent, though, and is making me think of summer while I look out at the snow on the ground! Smells very green and grassy with a hint of sweetness and bit of tart citrus. Are you spraying or dabbing? It admittedly isn't a powerhouse scent, but it does better than 2 hours on me. I'm spraying. I can still smell it, but it's quite faint. Smelling my wrist, I detect nothing. I think my clothes may have absorbed it better than my skin. Smells good, though. Maybe try the lotion then? I do think it lasts a bit longer. You can find it discounted if you look around online. I sampled this for the first time the day before yesterday and it has gone straight to the top of my “must buy” list (along with Acqua di Palma Intensa and L'Occitane Ambre which is supposed to be for women but shurely shome mishtake?). …Sur Le Nil is wonderful and makes a change from the endless boring openings from most major brands “zesty blahdy blah”. This is a mixture of lucious floral and spice with a delicious drydown. I will be buying this one whilst relishing the fact that I love wearing L'Eau D'Hermes just as much – it's sooooo naughty. Woof Woof. Sur Le Nil, is my good side strutting and purring in good weather. I am starting to seriously worry about my sanity. I'm planning to buy a full size of Jardin Sur le Nil but after reading these comments I start hesitating. Here in Taiwan we have excess heat and humidity for summer while real cold temperature and much rain in winter. So does temperature has real impact on how I smell if I wear this? Will I smell funny if I spritz some during winter? RoseHuang, you will smell wonderful when you spritz during wintertime!! To be honest, I like it even better during wintertime. Rose, no, you won't smell funny. Some people just prefer to save lighter, more citrusy scents for summer and wear heavier scents in winter… personally, I find wearing summery scents in winter very cheering. Plus, Sur Le Nil has that nice incensey base which I think holds up well in colder weather. Managed to test this today, twice actually and I loved it! Your description is spot on as usual! It was better on skin than on paper as with most fragrances. I think it was the fact that it's very refreshing, fruity but not overly sweet, starts off citrusy without being piercingly sharp. I've decided to get a bottle of this (my first summer fragrance this year) Funny thing is I wouldn't have thought it was a unisex fragrance until I read it here, I thought it was quite femine. I also quite liked the Mousson one but there was something about that cantalope-smelling-note that wasn't suited for me now. Reminded me of being a little girl and putting on those melon flavoured lip balms (only cause I loved the smell). I didn't get to try Mediterrannee but your short description of it makes me very curious. I love figs so I wonder whether I'd like this (although I have yet to find a scrubber amongst the Hermes). So glad you like Sur Le Nil, I am surprised by how much I continue to wear it even now. Do try Osmanthe Yunnan as well, I think it is equally wonderful. The story about how this perfume was made is detailed in Chandler Burr's newish book, _A Year Inside the Perfume Industry in PAris and New York_ – a fascinating read. Mr. Burr also writes about the Sarah Jessica Parker scent, Lovely. Can't put this book down! Long time lurker; first time poster. I tried Un Jardin Sur le Nil at Sephora for the first time this weekend after seeing it raved about here, just to see what all the fuss was about and oh my god, I am in LOVE with this. I spritzed it on my wrist and I could not stop smelling myself all day. I tried it on probably around eleven in the morning and it still smelled fabulous at seven. I get a lovely herbal woods-y vibe from it that I love. The dry-down is beautiful and I swear I get a whiff of lime in it. I'm on the hunt for a new perfume. My usual rotation of Daisy, Euphoria, and Breathless by Victoria's Secret just isn't doing it for me anymore. This blog is my bible when it comes to this god-awful long hunt and if the other scents I always see here go over as well at the Jardin Sur Le Nil, I'm going to be flat broke but at least I'll smell fabulous. Anything else I should try as far as must-smell perfumes go? I am but a student and you are the masters. Hi Rosie Jane, and welcome! So glad you loved Sur Le Nil. You sound like a good candidate for a Monday Mail article, have you seen any of them? You can find a complete list if you look under the “General Perfume Articles” on the bottom menu, and if you're interested, shoot me an email at nowsmellthis at comcast dot net. I can't think of anything that close. I wonder if it is worth trying the body lotion? Wow, this is great stuff! I found a 15-ml bottle online for $20, and I'm very glad I bought it unsniffed. I think I love the green top best – it's aqueous and reminds one of cool, green, streams and ponds, without the dreaded “aquatic accord.” I might search for the lotion, too – it's summery without being very floral, and the scent seems to be one of those intelligent ones that have something different to say each wearing. Tried Eau Parfumee au The' Vert yesterday and found it very dull, once it got past its citrusy green opening. I mean, Bohhhh-ring, as in, I've smelled this rose-jasmine-muguet heart many many times before, and it was better in other scents. Disappointing. But hey, I've got Nil now… not sad. I am so excited this may be available online at this discount! I put it on a test strip at Neiman Marcus and drove home with it held to my nose, I couldn’t get enough. It smells like summer; I thought, tomatoes! I was sure there would be a glowing review in my “Perfumes The Guide” and was so suprised by Turin’s lukewarm review. Also surprised he referred to Jardin en Mediterranee as tomato stem, I don’t smell that at all on my test strip, did he mix up the two?! By far my favorite of the three Jardins (tried them all today). Well, in all fairness to the Bvlgari — you have smelled that sort of green tea scent a hundred times before, but Bvlgari did it first! Glad you love Nil though! And the lotion is absolutely perfect, do try it. Is there anyone here who remembers Estee Lauder’s Alliage? There’s something about the opening notes of Nil that brings Alliage back to me–of course they’re both very green and maybe they both have a citrus blend? A few months ago the Estee Lauder counter at the Macy’s near me actually had Alliage–but when I sniffed it somehow it was much harsher than the fresh green I remembered–I thought it must be a reformulation. The saleslady at the counter said that it hadn’t changed, but our tastes have moved away from the 80s scents so that they smell harsh to us now. She said that was one reason they made Pure White Linen. Back to Nil–I think that my husband actually liked it more than I did. For me it was a 4 star, for him it was a 5. Oh, I’m sure it’s been reformulated. There’s just about nothing that old that hasn’t been, even if it’s been a respectful reformulation. At any rate, yes, they’re both green & both have citrus. Haven’t bought Nil yet but tried it on again today and still love it. (Sephora now carries it.) However, I think it may be a perfume I admire but don’t wear. It’s just so vegetal. Maybe “appreciate” is more appropriate than “love”. Maybe I’d wear it if I lived in southeast Asia or somewhere else hot and humid. Speaking of Alliage, I tried to sample that at the Saks – or was it Neiman? – EL counter, but they had it downstairs in their stockroom and said they don’t open it for samples. Too bad you don’t like the reformulation…oh well. Oh that’s odd…most EL counters have testers of everything, even if they don’t put them on the counter. I’m relieved to hear that it must be a reformulation! It was such a grating chemical dark green, not at all like my memories of Alliage, that I was wondering how I could ever have enjoyed it. I receently purchased a sample of Un Jardin Sur Le Nil and I tried it today. It barely made it past the bathroom door in lasting power. Loved the scent on first spray and wished it would have stayed with me. It is a scent I could wear if only I could smell it on me. I should catch a whiff of scent whenever my arm passes near my face. I shouldn’t have to jam my wrist against my nose and inhale like a typhoon to find the notes. Oh my! It is not a powerhouse on me, but it isn’t nearly so fleeting as that. Shame. I only recently smelled this fragrance at Sephora (April 2014) and they were able to give me a small sample of it. Spehora has tiny vials that they squirt a few spritzes of the fragrance into. Then they put a tiny pump into it and put a top on it…Genius! They put your little sample into a small plastic bag and label it so you then you can take it home and try it out to see if you love it. Well, I loved it!! And I am willing to pay full price for a bottle of it. I have been discouraged from online stores since a few times, I have received fake fragrances. Sephora is really nice about samples! Nordstrom is too, although they don’t have the nice pump sprays.